Stay connected, just Bopup me! : Is the branding of the IM software required for a company? Is the branding of the IM software required for a company? To what extent is the functionality to brand instant messaging clients required for companies and business entities? Is this needful to get the IM products branded if a company purchases the software? We agree that branding is the most important key to embed the business IM software to the working environment much better and intergrate it within a company's identity, existing servises and software. But another question is: what is an ease of the branding, what is time and cost to get the client-side corporate messengers branded with a company's logo/image? Custom installation packages of the software that are already branded with a customer's image. Manual deployment of the branding to the end-user messengers including copying files, configuring settings, etc. Supporting on-the-fly deployment of the brand logo that is uploaded on a central IM server to get visible in the connected messengers. OK, if the company has hunreds and hundreds user workstations it is impossible to tune each messenger and to handle branding manually. If a vendor provides custom setup packages to his customers then he must build and provide a lot of custom installations when a new version of the messenger goes live. Then the most quite way is an ability to upload a brand logo on the IM server to get the messaging clients branded dynamically. 1. Start the Management Console and go to the "IM Client Updates & Branding" view. 2. Scroll down to the Branding and click "Upload new brand logo" link. 3. Browse a BMP file you want to upload as a brand logo. You can also enter a custom URL to associate it with the image. The URL can be internet/extranet link started with the 'http://', 'https://' or 'www. ', link to a network resource with '\\' prefix or to a local file with 'file://'. 4. 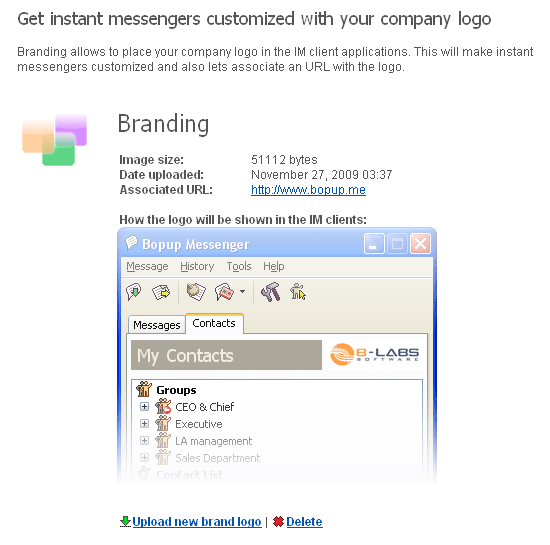 Currently uploaded logo is shown in the preview of Bopup Messenger client. You can also refer to the online help of the Bopup Communication Server product at IM Client Updates & Branding to see how the Branding feature looks in the console.